In ancient warfare, the Greek hoplites deployed in tight formations called phalanges, which were eight or more ranks deep. The usefulness on the rear ranks is still a matter of scholarly debate, but many now believe that the rear ranks had a role beyond replenishing casualties in the front ranks. The "physical pushing match" school of thought believes that the rear ranks exerted so much pressure on the front ranks that the resulting shock action of the phalanx was, at least partially, a physical push forward. 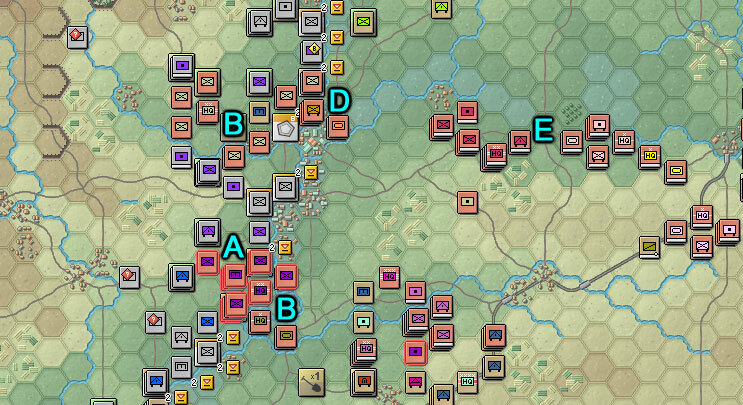 I'm enjoying John Tiller's free demo for the Panzer Campaigns series. You can ask for it in this webpage. I recommend this fantastic graphics mod for a more complete enjoyment. The demo features the Soviet offensive in the river Mius in July 1943. I'm not new to commanding a whole Soviet WWII front in an offensive against prepared German defenses. But I'm not getting any better! The Soviets had a penchant for precise calculations of the attacker/defender ratios and as a result, many breakthroughs were concentrated in narrow spaces so to overwhelm the enemy. While playing this scenario today, I've got some of the infantry divisions tasked with the initial breakthrough entangled in bunker-busting and stopped cold in their tracks. The follow up units that were to exploit the breakthrough couldn't move forward for a hasty support (you can't stack that many units in a single hex). 17 July 1943. The Soviet South Front (brown counters) opens an offensive against the German Sixth Army (grey counters). A: the 34th Guards Rifle Division (purple inner counter color) has broken the German defense line but is stopped by stubborn defenders fighting from prepared positions. B: the follow and assume formation, 32nd Tank Guards Brigade (green inner counter color) can't move forward due to stacking limitations. B: the 40th Guards Rifle Division (light green inner counter color) fared way better than its southern neighbor division and has opened a wider gap, penetrated deeper and is expanding the bridgehead. D: the 13th Guards Mechanized Brigade advancing to expand the bridge head. E: follow up units moving towards the front. In the example above, the 34th Guards Rifle Division/32nd Tank Guards Brigade phalanx has only one way and that is forward into the meat grinder at the tip of the riflemen battalions. At the scale of this fight, men don't just drop dead under their shields like in the ancient world. Fresher troops can't jump over them. The fatigue, morale and firepower of the men at the front drops in the span of several hours, not minutes. Packed in high density formations, there is neither a way to move the combat-depleted men to the rear nor a way to move new troops forward. It's a macabre calculus, but the men at the tip of the spear are now more worth dead than alive. Thanx for this short review. I like JT’s PzC series and Mius is a great addition to the existing portfolio.